Long-toed salamanders are medium sized amphibians, growing up to 8 to 12 cm in size. As their name suggest, the long-toed salamanders have long toes. 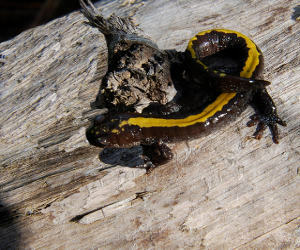 In Canada, their is 3 subspecies of these Amphibians : the eastern, central and western long toed salamanders. They are usually black or dark colored with a green to yellow dorsal stripe and are spotted with white flecks and have a brown colored belly. These amphibians lives in the Rocky Mountain range of British Columbia and Alberta. This subspecie have a narrow yellow dorsal stripe and a colored patch on each eyelids. This subspecie of salamander can be found in most of British Columbia west of the Rocky Mountains. It can be distinguished by it’s bright yellow to tan dorsal stripe that doesn’t break into stripes except on the head. In Canada this subspecies is present on Vancouver Island and in the extreme southwest of mainland British Columbia. They can be distinguished by their greenish dorsal stripe with infinite edges and by the really present with markings on their sides. As many amphibians their are mostly nocturnal and they are hard to observe since apart of the breading season they spend most of their time underground in crevices and holes digged by other animals and amphibians. Long toed salamanders grow only in warm seasons and rings can be distinguished counted to determine their age. With this method, it is estimated that the lifespan of long-toed salamander in Canada can go over 8 years. Long toed salamanders feed on a wide range of preys consisting mostly of invertebrates and insects and their larvae eat zooplankton but sometime their also display cannibalistic behaviours..